NewsOne and uhurunews.com are reporting on how a well known African American Islamic leader in Detroit who headed the Masjid Al-Haqq mosque on the city’s west side, was shot to death by Federal Bureau of Investigation agents on October 28 at a warehouse in Dearborn. Imam Luqman Ameen Abdullah, 53, was killed during the course of a series of raids by both federal agents and local police departments resulting in the arrests of 11 people.reporting that the Feds have Killed a 53 year old Black Muslim Leader In Michigan. 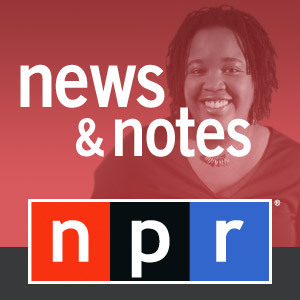 AP: Corporate Media Report: DETROIT — Federal authorities on Wednesday arrested several members of a radical Sunni Islam group in the U.S., killing one of its leaders at a shootout in a Michigan warehouse, the U.S. attorney’s office said. Agents were trying to arrest Luqman Ameen Abdullah, 53, at a Dearborn warehouse on charges that included conspiracy to sell stolen goods and illegal possession and sale of firearms. Authorities also conducted raids elsewhere to try to round up 10 followers named in a federal complaint. No one was charged with terrorism. But Abdullah was “advocating and encouraging his followers to commit violent acts against the United States,” FBI agent Gary Leone said in an affidavit filed with the 43-page criminal complaint unsealed Wednesday. In the complaint, the FBI said Abdullah, also known as Christopher Thomas, was an imam, or prayer leader, of a radical group named Ummah whose primary mission is to establish an Islamic state within the United States. He told them it was their “duty to oppose the FBI and the government and it does not matter if they die,” Leone said. Abdullah regularly preached anti-government rhetoric and was trained, along with his followers, in the use of firearms, martial arts and swords, the agent said. Leone said members of the national group mostly are black and some converted to Islam while in prisons across the United States. A well known African American Islamic leader in Detroit who headed the Masjid Al-Haqq mosque on the city’s west side, was shot to death by Federal Bureau of Investigation agents on October 28 at a warehouse in Dearborn. Imam Luqman Ameen Abdullah, 53, was killed during the course of a series of raids by both federal agents and local police departments resulting in the arrests of 11 people. Corporate media reports on the killing of Imam Abdullah and the arrests of the others, has been framed as a “counter-terrorism’ operation. This is being done despite the fact that the raids were conducted based on criminal complaints that have no specific allegations of violations of federal law or acts of terrorism. However, many people who knew Imam Abdullah and the members of Masjid Al-Haqq say that the group worked to rid the severely oppressed community where the mosque existed of the social ills resulting from years of exploitation and neglect. Even the mosque itself fell victim to the economic crisis that is worsening in Detroit. On January 20, Masjid Al-Haqq was evicted from the building where they had been housed for years as a result of tax foreclosure. The mosque relocated at a home on Clairmount which was also raided on October 28. AAPP: Are black groups under attack by the federal government? Are blacks losing their rights under a black president? What do you think? Why is the United States not attacking Neo-Nazi groups, hate groups, and terror suspects who are Buying Firearms. 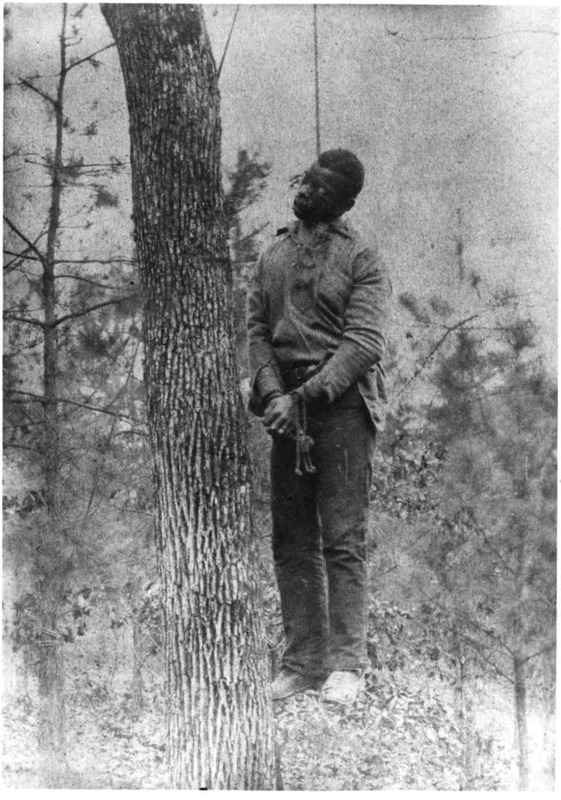 Maybe we as black folks are losing our rights even in the age of President Barack Obama. What do you think? AAPP: I understand why people would be concerned. The Washington Post is reporting that House ethics investigators have been scrutinizing the activities of more than 30 lawmakers and several aides in inquiries about issues including defense lobbying and corporate influence peddling, according to a confidential House ethics committee report prepared in July. Ellen Nakashima and Paul Kane staff writers with the Washington Post are reporting the a number of members of the Congressional Black Caucus are being investigated for defense lobbying and corporate influence peddling, according to a confidential House ethics committee report prepared in July. The document also disclosed that ethics committee staff members have interviewed House Ways and Means Chairman Charles B. Rangel (D-N.Y.) about one element of the complex investigation of his personal finances, as well as the lawmaker's top aide and his son. Rangel said he spoke with ethics committee staff members regarding a conference that he and four other members of the Congressional Black Caucus attended last November in St. Martin. The trip initially was said to be sponsored by a nonprofit foundation run by a newspaper. But the three-day event, at a luxury resort, was underwritten by major corporations such as Citigroup, Pfizer and AT&T. Rules passed in 2007, shortly after Democrats reclaimed the majority following a wave of corruption cases against Republicans, bar private companies from paying for congressional travel. According to Wapo Rangel said he has not discussed other parts of the investigation of his finances with the committee. "I'm waiting for that, anxiously," he said. There is more.. According to Wapo, Politico, and The LA Times, the committee did not detail the two newly disclosed investigations. However, according to the July document, Rep. Maxine Waters, a high-ranking member of the House Financial Services Committee, came under scrutiny because of activities involving OneUnited Bank of Massachusetts, in which her husband owns at least $250,000 in stock. Waters arranged a September 2008 meeting at the Treasury Department where OneUnited executives asked for government money. In December, Treasury selected OneUnited as an early participant in the bank bailout program, injecting $12.1 million. AAPP: Voters in their congressional districts need to take a hard look at these Corrupt Congressional Black Caucus members. It just may be time to throw these folks out of office. I know if any of them were representing me, I would vote them out of office in a heartbeat. I guess Cathy Hughes would do the same thing. If I were Obama I would not meet with the Congressional Black Caucus until they stop standing up for crooks, get there act together and purged those who bring the group into disgrace. I'm also getting a bit tired of these Congressional ethics inquiries, that have been dragging on for sometime despite vows to end corruption. I guess I can understand why some democrats are worried that one of their own could cost them their jobs. Another man killed by Taser Torture. I know your asking yourself, Why Are Cops Tasering Grandmothers, Pregnant Women and Kids? Who got tased this time? Well, this time the police were called by the alleged suspect at 10:02 p.m. about a home invasion on Trousdale Avenue. En route to the scene, police encountered Jeffrey C. Woodward, 33, of Old Hickory. According to police, Woodward was walking down the street carrying a knife. After surrendering the knife, Woodward reportedly told officers that someone was holding his mother in her house against her will. Upon investigation, Woodward’s mother was found to be OK, resulting in police arresting Woodward for filing a false report. As officers attempted to arrest Woodward, police say, he began to fight with officers, resulting in a Taser deployment. Woodward, who was approximately six feet, four inches tall and weighing 200 pounds, was brought to the ground and handcuffed before jumping to his feet and running away, police said. Police said Woodward threw himself onto the hood of a K-9 Unit patrol car before he was taken into custody once more. It was soon after that that police believed Woodward was suffering from a medical problem and called for an ambulance. Woodward was transported from the scene to Sumner Regional Medical Center, where he died soon after. AAPP: This is one of the many reasons we are having a day of blogging to Stop Taser Torture on December 4, 2009. As reported in the local newspaper, Tennessean.com, Shawn Hill, 22, of Gallatin, said he was trying to get a little extra sleep Tuesday night before going to work, hitting the snooze button on his alarm clock when he heard a struggle outside. Stepping out of his home, Hill said he witnessed the struggle between Woodward and police. Hill said he watched as Woodward ran from the police and dove onto the hood of a police car. Hill said Woodward’s mother pleaded with officers not to kill him. He said Woodward himself was also yelling. Hill said that police deployed the K-9 unit against Woodward after he jumped onto the hood of the patrol car and was taken to the ground by several officers. “While he was on the ground, they let the dog out to get on top of him,” Hill said. Storment said a K-9 was there, but as of Wednesday afternoon, Storment was unsure whether a K-9 dog made contact with Woodward. While police are investigating what happened, Storment said he doesn’t believe any charges will stem from the investigation and that they have no reason to believe the officers used excessive force. There is more, also on Saturday, Amani Myles was re-elected to a second term as President of the Kansas State NAACP Youth Conference. 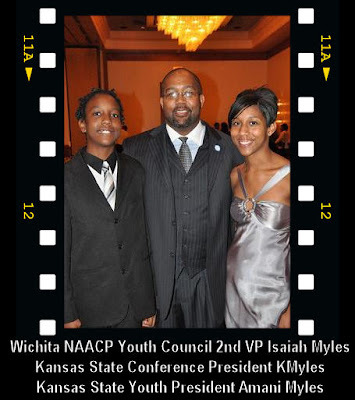 As reported by the Wichita NAACP blog, this is the first time a Father and Daughter in the NAACP have served as the Presidents of a State Adult and Youth Conference simultaneously. Congratulations Isaiah, Amani and of course K. Myles! We look forward to hearing about your plans to take the Wichita and Kansas NAACP Conference to the next level. I'm so excited that Carmen D. at "All About Race " is back. As Carmen D says, "Since AAR launched in March 2007, a whole lot has changed about the way we discuss racial issues in America. Two and a half years ago, the notion of a black president was most realistically relegated to Hollywood imaginings and the white knuckle reality of 24”. More HERE. After you read my blog, make sure your next step on the internet is over at All About Race.com. You will be glad you did! Gromer Jeffers Jr. reports in today's paper that the Dallas County GOP is giving up recruiting more blacks. The party's African-American Leadership Council is going out of business, according to its leader, Calvin Stephens. Yes, Barack Obama's presidential campaign had a lot to do with the GOP's recruitment difficulties, but there's a lot more to it than that. The GOP stands for a lot of things that folks in southern Dallas can -- and should -- embrace. I've got no quibble, for example, with people taking a strong stand for personal responsibility. Not everything that's wrong in the lives of blacks or anyone else in poorer areas of the city is the result of rich whites beating them down. Sometimes, people have to own up to their own mistakes. Lots of black preachers are adamantly opposed to abortion. They strongly believe in entrepreneurship and pulling oneself up by the bootstraps. William Dwight McKissic, a black Republican, defends many of these values even though he also defends efforts by Obama to speak directly to American kids in hopes of inspiring them to stay in school and make good grades. But this is where the GOP repeatedly falls down. It seems like the minute anyone speaks positively about Obama or gives credit to Democrats for doing anything right, a hailstorm of derision and mean-spirited venom rains down upon that person -- as McKissic found when he was attacked by conservative columnist Mark Davis in this newspaper. We have a number of conservative "trolls" on this blog, like Rick Atkinson, who seem to have no other mission in life than to blindly criticize using the most confrontational language possible. And that's the daily Davis modus operandi. He spouted off against McKissic, wrongly assuming he was just another liberal black Democrat, without bothering to check McKissic's background. And when Davis's errors were pointed out to him, did he apologize in the same public forum he used to attack McKissic? No way. The goal is to unite the world’s bloggers in posting about the same issue on the same day – Taser Torture in America, Canada and throughout the world. Join in on December 4th. “Stop Taser Torture, blogging for Justice.” as we raise awareness and trigger a global discussion. Contact us at: StopTaserTorture@gmail.com to register your blog. H/T to the Grio, The crowning of Nikole Churchill as the first non-black Miss Hampton University has caused a ruckus at the historically-black college and throughout the African-American community. Hampton alumni, bloggers, and callers into black radio talk shows are upset that Churchill, 22, was selected to fill a representative role for a traditionally black institution. As a student at Hampton, Churchill was certainly eligible to compete and ultimately win the award. Any objections to her crowning that are based on her skin color are nothing less than hypocritical. AAPP: Who cares if the young lady where the lady is from. I say congratulations to her. Hey black women at Hampton University - Step up your game! According to The Washington Times, Voter doldrums - especially among blacks far less energized than they were for Barack Obama's historic presidential bid last year - pose problems for Democrats struggling in the governors' races in Virginia and New Jersey. Pollsters and election analysts expect a steep drop-off of black voters - who historically back Democrats - in the nation's two gubernatorial contests and in congressional races Nov. 3, and they predict it is likely to cast a shadow in 2010 over at least 10 House Democrats with large black constituencies. It is part of a broader trend of waning enthusiasm among Democratic voters as the country grapples with continued job losses, a mounting federal deficit and uncertainty about Mr. Obama's plan to restructure the health care system. AAPP: I agree with the pollsters and election analysts who predict that black voter turnout is likely to cast a shadow in 2010 over at least 10 House Democrats with large black constituencies. These democrats better learn how to speak to and address, or the Republicans will be right back in in 2010.